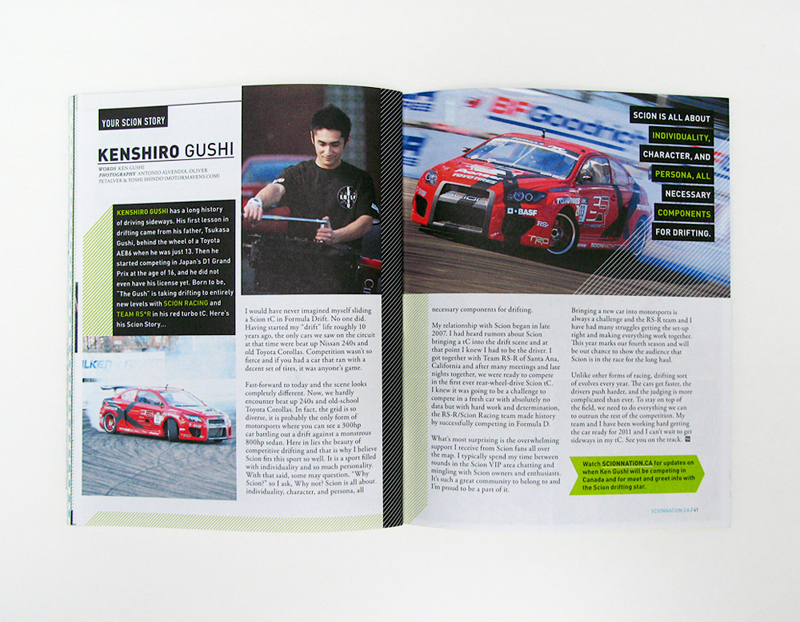 Scion Magazine Issue 6 (Inside Issue) continues in the same format as issue #5: 48 page magazine at 10.25" x 14.5", printed on the matte recycled stock. 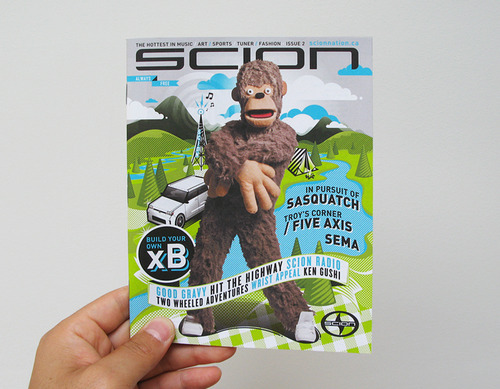 I want to send a big shout out to the Scion team: Lisa Marie Chen (Editor-in-Chief), Olivia Truong (Designer / Illustrator), Rachel Kennedy (Designer), Shauna Roe (Writer), Sheraz Amin, and newcomers to the team: Joel Arbez (Art Director), Christian Buer (Designer / Illustrator), and Matt Antonello (Writer). Thank you for all your hard work! With the cover, we decided to go with an illustrated execution. I won't get into the technicalities of this particular FR-S on the cover (it's been strongly influenced by my recent trip to SEMA and the Tokyo Auto Salon.). Anyhow, the theme being 'Inside', I'll admit it was quite difficult in honing into an idea that would convey this. 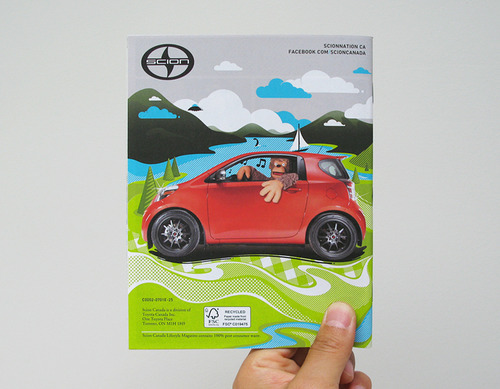 The magazine was to be released at the Toronto Auto Show, so it was mandatory that a car be on the cover. Without overthinking the concepts of 'inside' and a car, we decided to keep the idea rather simple, and then push much harder on the execution. Each of the elements exploding out of the open hood refers to each one of the stories or ads in this issue. The back cover (again very simple), is the back of the FR-S, (inside of a tunnel) driving towards the opening (url). 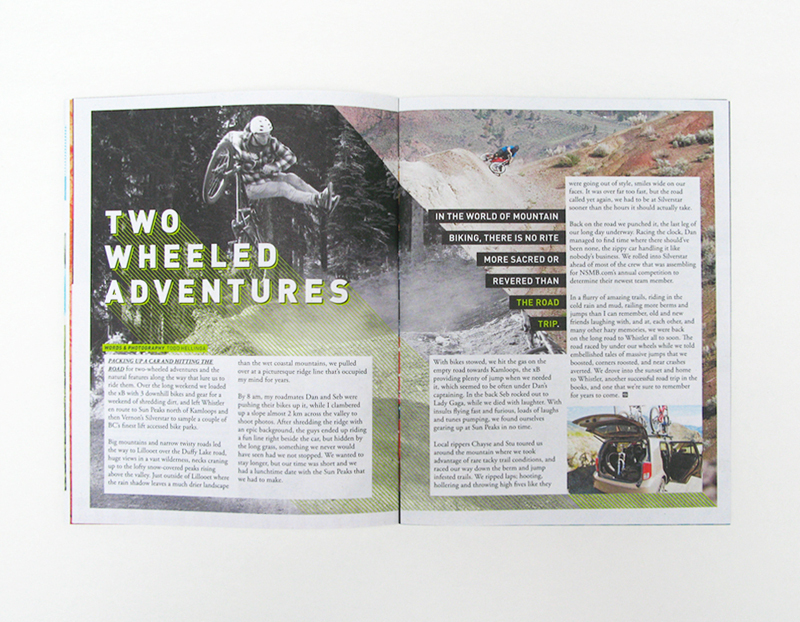 The illustrations are treated more 'graphic-like', coloured in only black, white, and 2 PMS (green & blue). The goal was to look 'wintery' without the typical wintery imagery or colour palette. 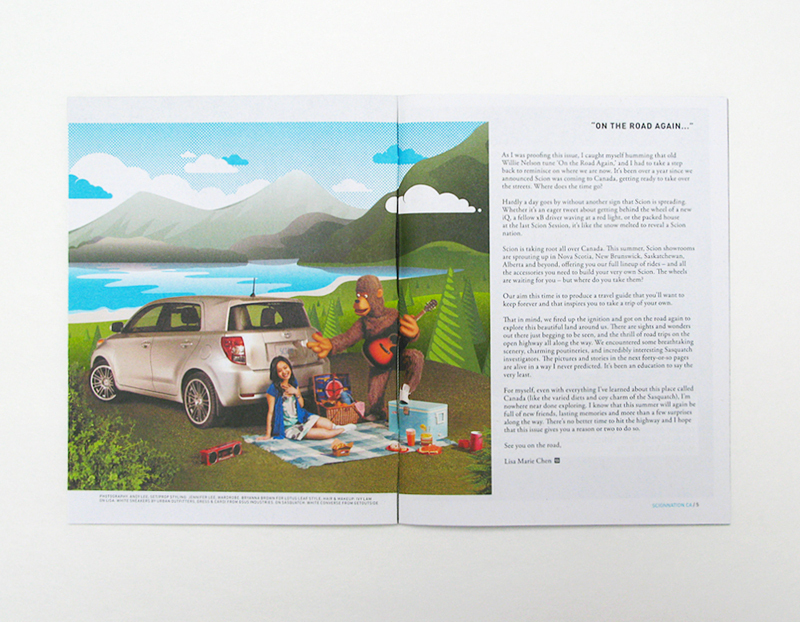 Inside the magazine, you'll notice that there are 5 car ads (with animal heads). 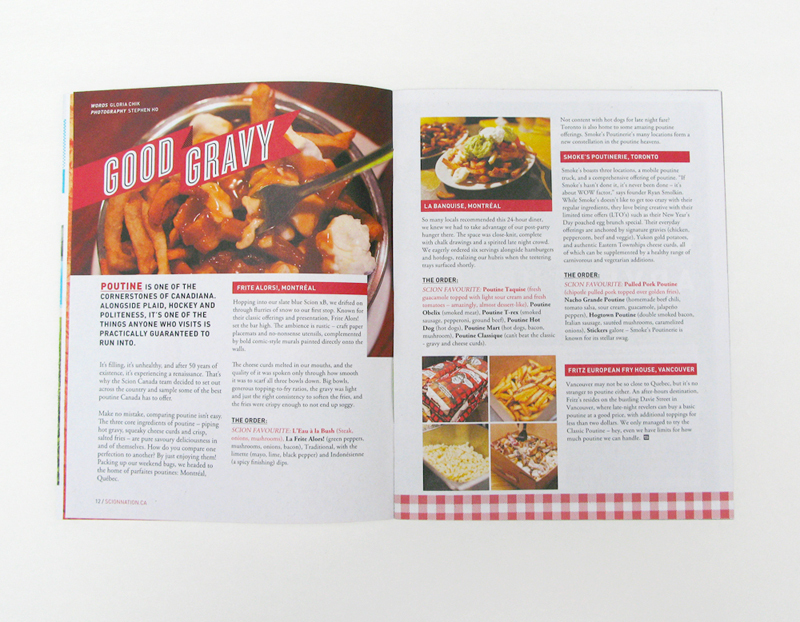 These pages are all LAYAR activated, meaning they all play some fun video content. A big shout out to the team that worked on this: Joel Arbez, Christian Buer, Lisa Marie Chen, Clay Stang (Photographer), Reynard Li & Rico Moran (Assistants), Matt Antonello, Kyle McNair (Video Editor) and Pat Cyr. Some of us got to be photographed with a mask on. Can you guess who's who? Last but not least, there is also a fun video of designer, Matt Law (ML24) drawing a car from start to finish in his story, in which he is interviewed by none other than Troy 'Five Axis' Sumitomo! Let me know what you think of the latest.